Frances Rivera-Hernández is a planetary geologist and PhD student at University of California, Davis. She has a Master’s degree in Earth and Space Sciences from the University of Washington, and Bachelor’s degrees in Geology and Astrophysics from the University of Wyoming. 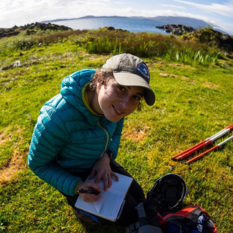 Her research aims to understand the climate and habitability of early Mars and Earth by reconstructing ancient depositional environments (e.g., lakes, rivers, dunes) from sedimentologic, stratigraphic, and remote sensing datasets. Her PhD research with Dr. Dawn Y. Sumner, focuses on sedimentation processes in Antarctic lakes and the development of a novel tool to constrain the grain size of sedimentary rocks on Mars using data from the ChemCam instrument on the Curiosity rover. In addition to her Antarctic field work, she has studied in France as a Chateaubriand STEM fellow, trained as a cold-water scientific diver, and works on the Science and Operations Teams for the Mars Science Laboratory mission. Frances is a native of Aguas Buenas, Puerto Rico and enjoys cooking, traveling, and engaging in conversations in both Spanish and English. Reach her on twitter at @francy_pants or via email at [email protected].